“For most of the history of humankind, going back to Stone Age, the sky has served as a tool. […] From the sky they gained — and we, their descendents, have inherited — a profound sense of cyclic time, of order and symmetry, and of the predictability of nature. I was booked to attend the press preview of Grant Wakefield’s documentary Ancient Skies at the Winchester Science Centre on 2 September 2014. Due to work commitments on the day, I was unable to make the screening and have subsequently been kindly provided with a viewing of the documentary by Pete Glastonbury, who was involved with its production. Zhenia Mahdi-Nau here (first two minutes), which immediately engaged my attention. The natural curiosity of man to know of and define his position in time and space probably arose along with self consciousness itself. Ancient Skies considers our relationship with azimuth, pure direction, which is derived solely from the movements of the heavens. Over generations, ever more precise mapping of celestial bodies enabled the development of accurate calendars, navigation instruments, etc. Ancient Skies does not, however, offer merely a history lesson in the development of mathematics, astronomy, and related science over the millennia. Not long into the documentary there is an intriguing reference to an accidental discovery of a solar effect by light artist Charles Ross in 1970, described by the gentleman himself. Not being previously aware of this discovery, I found his description of the manner in which he became aware of what is a primal solar form fascinating. Before writing was first invented in Iraq around 3,000 BC, stone circles, stone rows, quoits, chambered cairns and barrows of the Neolithic period were built, from around 4,800 BC, concentrated in the regions bordered by western Ireland, eastern Poland and North Africa. Ancient Skies contends that this represents a forging of links between humans and the sky, helping conceptualise time for our Neolithic ancestors. 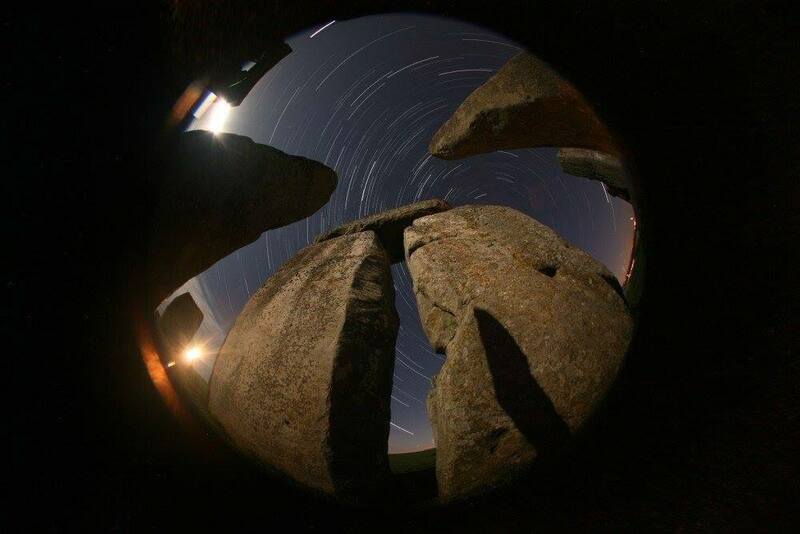 A brief history of the development of the sometimes controversial subject of ‘archaeo-astronomy’ is outlined, referencing Gerald Hawkins and his 1965 publication Stonehenge Decoded, which caught the public imagination, together with the works of Alexander Thom, who systematically analysed over 600 Megalithic sites, suggesting the use of a ‘Megalithic yard’, as well as solar, lunar and other celestial events being linked to certain monuments. The documentary moves to Ireland and a location at a bend in the river Boyne where Newgrange, Knowth and Dowth were constructed, sourcing materials from a distance of 50 miles. Newgrange alone is estimated to have required two million man hours to construct over many generations. The discovery by Michael O’Kelly at the winter solstice on 21 December 1967 of a band of light illuminating the chamber at Newgrange for a few minutes is cited as a giant achievement of the ancient world and the associated ‘rock art’ as having meaning and showing intention, particularly that on kerbstone 67, offering tantalising similarities to the primal solar form accidentally discovered by Charles Ross in 1970. Ancient Skies then moves north to the Outer Hebrides, the Isle of Lewis and Callanish, looking at traces of the community that inhabited the island around 3000BC, also investigating the Old Woman of the Moors, ‘Sleeping Beauty’, out of whose belly the moon is said to rise. The Orkney islands are visited, and the Neolithic village of approximately 3200BC at Skara Brae, first revealed during the winter of 1850 when Orkney was battered by a great storm, is explored. Ancient Skies examines similarities between ‘rock art’ lozenges and spirals at Newgrange and Skara Brae. Inevitably, the documentary moves south to Stonehenge standing in lonely vigil on Salisbury Plain in Wiltshire, a subject of endless fascination and speculation. The building phases at Stonehenge are clearly explained and illustrated, and the monument itself is beautifully filmed.The Bush Barrow Lozenge, discovered close to Stonehenge in 1808 by William Cunnington during investigations funded by Sir Richard Colt Hoare, is considered earlier in the documentary. This documentary covers a period of British prehistory and a subject matter I am keenly interested in. It serves the subject well and I found it genuinely thought-provoking and beautifully filmed. It left me saddened that we may never see what our ancestors saw in their Ancient Skies. Thank you to Pete Glastonbury for allowing me a preview of Ancient Skies, which I would wholeheartedly recommend to anyone with an open mind and interest in British prehistory should it become available on general release.